This years theme was 'Heavenly Bodies: Fashion and the Catholic Imagination" think priest vestments, robes, jeweled encrusted chalices, nun monochromes, stained glass windows and crazy ornate chapels. The directions in which one could go was endless! (Of course, it seems every year the theme with majority of the celebs attending is to actively stray as far away from the actual theme as possible.) In saying that, here are my best dressed of the night! My first up was one I was most surprised by, Cardi B in Moschino! While I listen to her music I can't say I've paid much attention to her fashion sense so was in awe when I saw her walk up those steps completely embodying the theme. 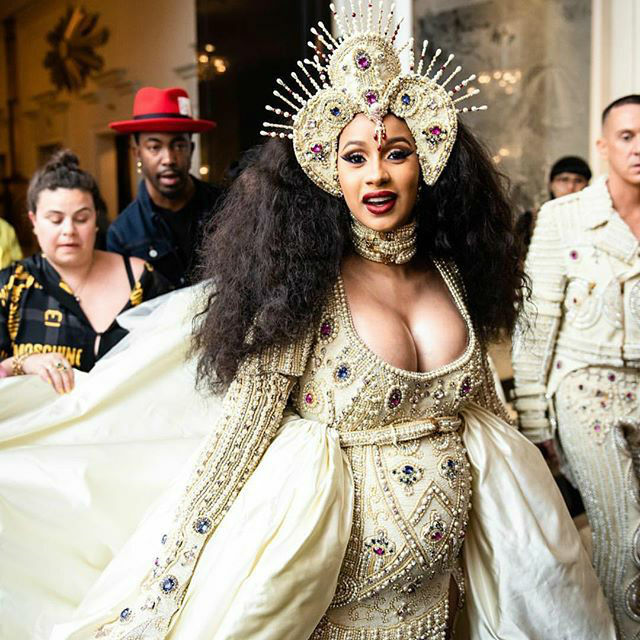 I have to say, I'm also surprised at Jeremy Scott, if you told me in advance he was dressing Cardi B - I would have expected something way too flamboyant, reminiscent of Nicki Minaj and Katy Perry's early days. I'm also amazed at the construction, this must have been fitted on her and finished the day of - after all, she is seven months pregnant! She really looks heavenly. You really can do no wrong when you put Lily Collins in Givenchy, it's like stepping into the past when Hubert de Givency and Audrey Hepburn reigned over the red carpets. While this look is minimal, it is in no way plain. The headpiece, construction, eye makeup resembling various religious statues and the rosary as an accessory, there's no way you would look back on this image a few years from now and mistake which Met Gala it was from. 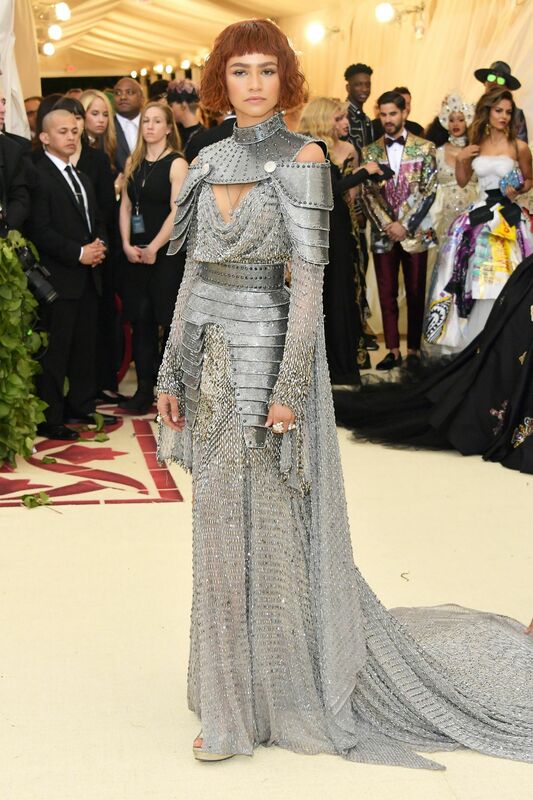 Then of course there's Zendaya styled by Law Roach in Versace in a different take of religious iconography, Joan of Arc. Is it extra AF - yes! But it's a themed gala for the Costume Institute, so in my eyes entirely appropriate, however saying that she was able to sidestep her look actually looking like a costume (unlike two unfortunate celebs that come to mind) I loved the strong but feminine look to this piece and how the metal seems to drape off her, in what could easily ended up swallowing her figure completely. Law Roach and Zendaya once again showing me why they're one of my fav red carpet duos. Greta Gerwig is simple but stunning in The Row - the luxurious material and construction doing the talking! Who says monochrome and a conservative silhouette can't be stunning? 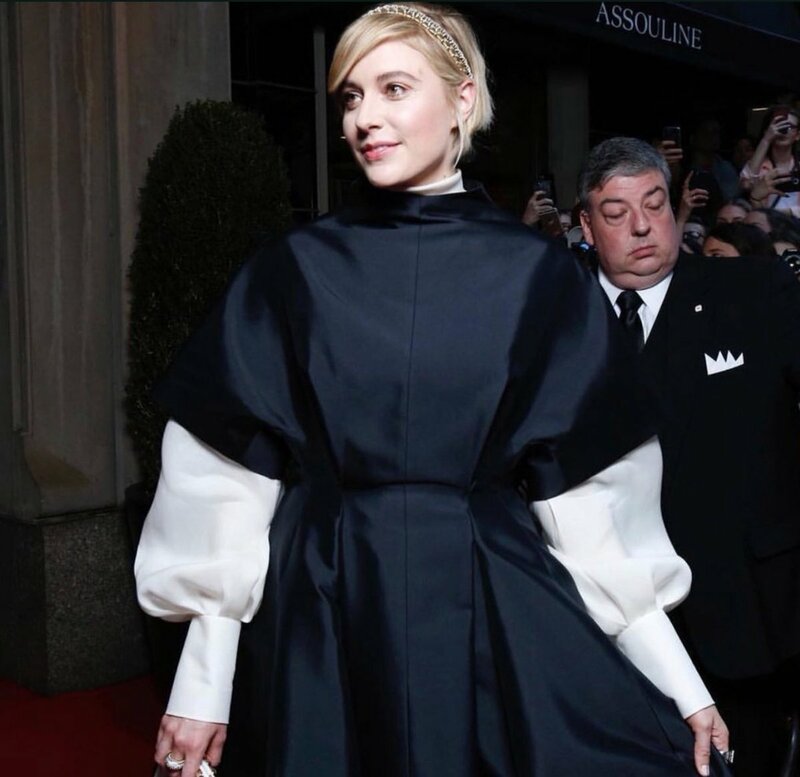 Greta Gerwig looks positively saintly, dare I say it - in this ensemble. One of the most surprising things I learned this year was that Blake Lively doesn't have a stylist - she works with the designers herself! In interviews leading up to the Met Gala, she shared that her dress took over 600 hours to make - and when she stepped out in this Versace gown, you really can see why. The bejeweled corset mimicking a chalice, the skirt and train resembling priests robes and the finishing touch - a custom made Judith Leiber clutch (the artist died late last month after a lengthy and successful life, it was so great to see one last great piece she made) with the initial of each of her family members on the four points of the cross. It was not only very on point with the theme, but also very similar to her feminine style she wears so well. 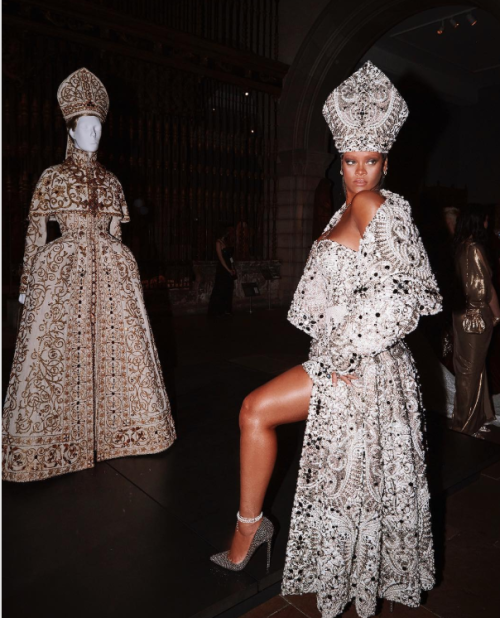 And of course, how could we forget our newly appointed pope, Rihanna? Of course it was no surprise that Rihanna brought it, because 1) she always brings it and a theme never scares her 2) she was finally co-chair of the event she pretty much rules over (bar Anna Wintour of course). She was dressed in Maison Margiela, designed by John Galliano, in which she was pictured standing next to a Dior Haute Couture piece during Galliano's time at the house (the picture at the start of this post). Kind of meta. What was your favourite look of the night? Let me know below! Blake Lively is and will always be my favorite! She's like a goddess!